Australia is one of those places which provides travelers unlimited options to complete items on their bucket list. 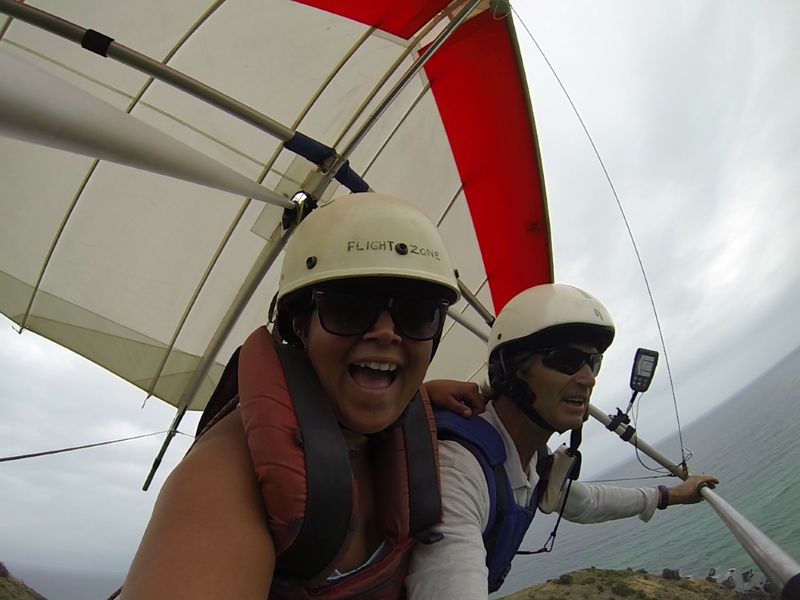 I was able to accomplish yet another item on my 2014 bucket list: Hang Gliding. 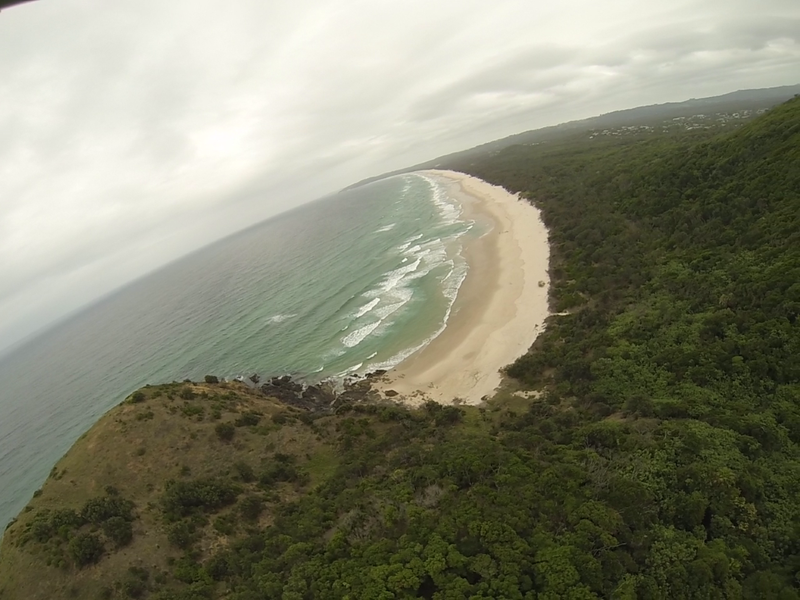 Flight Zone took me flying over Byron Bay like a Eagle searching for its prey. With views of Byron Bay, Tallow Beach, Byron Bay Lighthouse, and the wild wallabies below, I was left wondering in that moment if life could get any better. Traveling to some of my dream turquoise destinations while checking off items on my bucket list is a dream come true. I am living the ultimate dream; taking a year off from my job has been so rewarding and such a learning experience. I’ve been learning so much about myself and the world I am exploring. I realized that if I put my mind to something I can accomplish anything. I also realized that I am braver than I thought I was! The way I explain it is, I am not fearless, but have the courage to try new things and to go beyond my comfort zone. I am continually searching for new ways to challenge myself. Running off a cliff to go hang gliding, while trusting that I would soar and not fall to my death was another moment that challenged my fears. 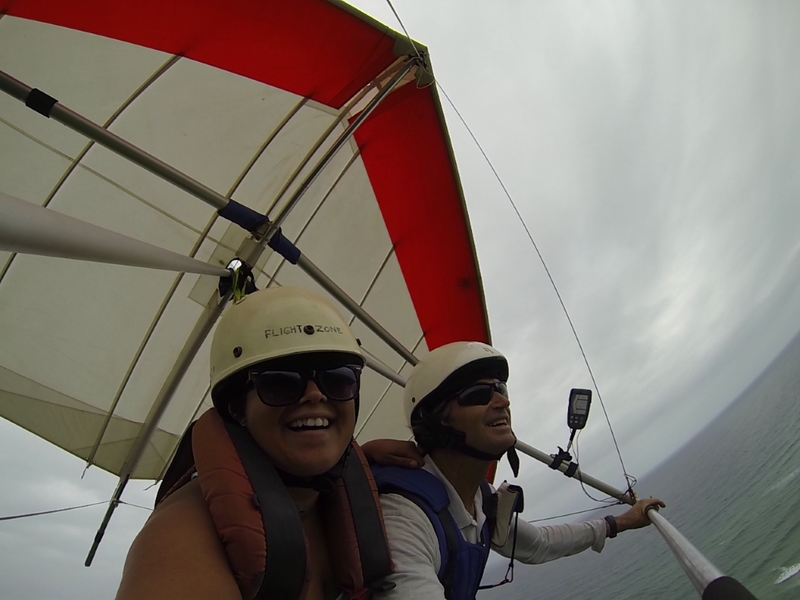 The fully certified flight school Flight Zone took me for a tandem hang gliding tour of a lifetime! 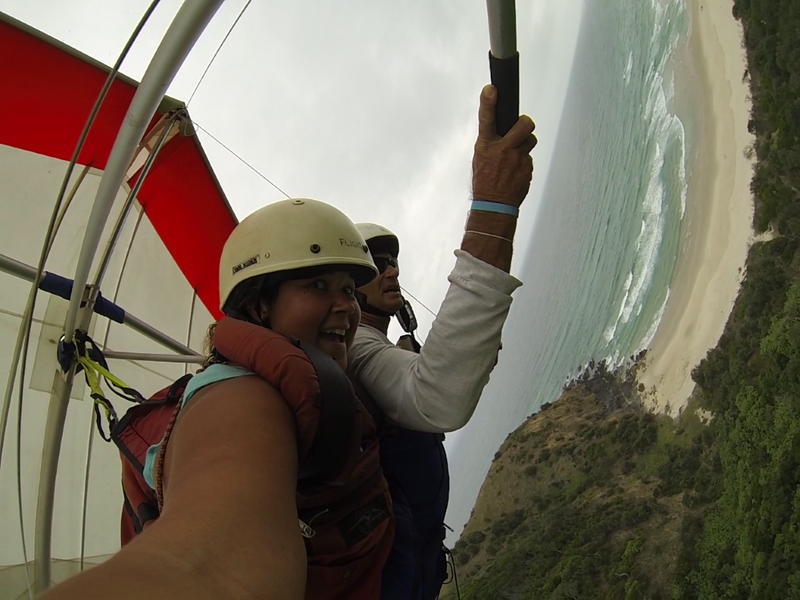 When I heard that hang gliding was possible in Byron Bay, I couldn’t pass up on the opportunity to do it. I’ve been wanting to do it for years, but the opportunity never presented itself. The day I decided to go hang gliding was also the same day I did it. Nothing like a quick decision. A spontaneous decision quickly had me high in the sky. I couldn’t think of a better way to see the beautiful and turquoise Byron Bay. It was well worth taking the risk to experience something so incredible. I don’t know if I’ll have the opportunity to do it in the future so the time is now. 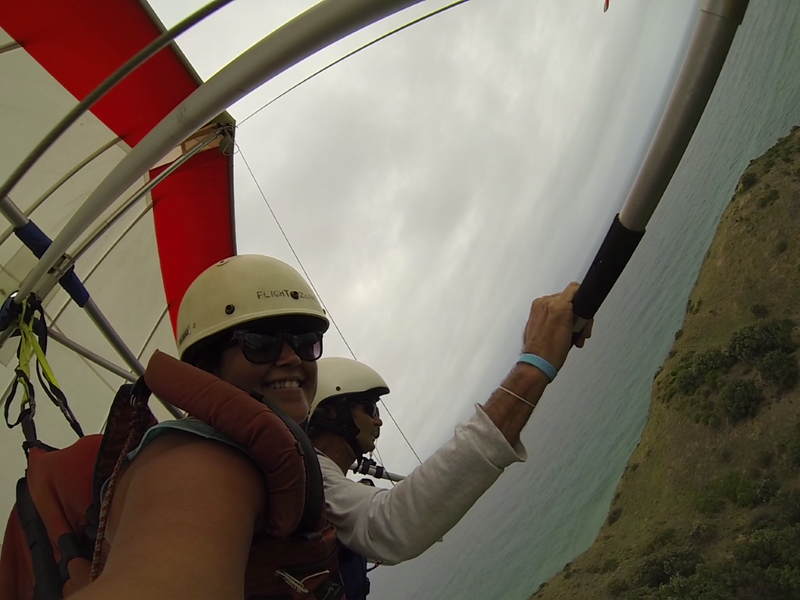 Hang gliding is thrilling, yet relaxing at the same time. Wrapped up like a caterpillar in a cocoon, I was able to see the coast from above, while hanging from an enormous kite which were my wings. I’ll never forget that moment, I felt invincible like I can conquer the world! This entry was posted in Australia, Bucket List, Oceania, travel, Turquoise Travel and tagged adventure, Australia, Bucket List, Byron Bay, experiences, Flight Zone, Hang Gliding, New South Whales, Travel, Turquoise Compass by Turquoise Compass. Bookmark the permalink. It was amazing, one of a kind, and I would do it again in a second! Thanks so much! You think so? You don’t think you would have done it? Hell NO!! I do NOT have a drop of adrenaline junkie in me. haha I guess you could call me an adrenaline junkie , I like the term! My thoughts, exactly! And how do you manage to keep your sunglasses on? Actually, I have no idea! haha lucky they didn’t fall off! You should really try it! It was an incredible experience! You should try it. Where do you think you would try it? That’s a good question. I think it would be spontaneous like yours was. 🙂 The best way to go because then the fear can’t talk you out of it! Yes, make sure it is a place with a view! Great photos, and it looks like so much fun! I think it would be better to do this instead of sky diving, since you already have your equipment open and don’t have to worry about your parachute not opening! Looks like a lot of fun. Thank you so much Michelle! It was such an incredible opportunity. I’ve done both and I think I like sky diving better in regards to the thrill, but hang-gliding is better for the view! Thats looks brilliant. Such a great location also. It was as you speak…brilliant! I think I chose a good location too. Have you tried it/would you try it? Wow, awesome! It’s on my list up there with sky diving…one day. ps I love Byron Bay! Thanks so much! It was a pretty awesome experience which you can tell from the big smile on my face in the photos! Where else in Oz have you traveled? Nope, I’m sorry but you would not catch me up there. I was nervous enough going on the hand gliding attraction at Walt Disney World. I’m glad you had such a blast flying like a bird though. Yeah, it is not for everyone, but it is for me. I had so much fun.